Mary’s 17th birthday is not going as expected. Her friends ignore her, she receives strange warnings that her life is in danger, and she keeps having terrifying visions. I’m going to stop there, as to say more would to go into spoiler territory. True, I picked it up based on the jacket copy which is spoilerific (read at your own risk), but I think it must be even more fun to go into this knowing as little as possible. This really reminded me of old school Christopher Pike and it kept me up into the wee hours because I just HAD to know what would happen. It’s a lot of fun, and logical in its own convoluted way. I loved the opening scene where Mary wakes up naked in a Crate & Barrel in NYC. It felt so original, and that same creative storytelling propels the novel forward. Although this is mainly Mary’s story, we also get to know the 6 other souls that are part of the title in surprising ways. All in all, very cool. Highly recommended! 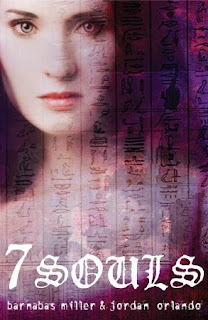 7 SOULS was released yesterday in hardcover. Find out more about it at the publisher’s website. I have this one on my wishlist, and yours is the first review I've seen. It sounds good, especially for an old school Christopher Pike fan like me! Oh my, I love me some Christopher Pike! I gave my kids a bunch of his books a few years ago, and had to reread a lot of them because I had such fond memories of them. This book sounds really good, and your likening it to Pike is all the encouragement I need. Thanks for spotlighting this one! Nice review. I've only heard a little bit about this...it sounds really good though. This book sounds like something I need to check out! Just from the opening you described it seems like a lot of fun! I had this one preordered for my Kindle. Looking forward to reading it. Now to find the time. Thanks for sharing! It's been so long since I've thought about Christopher Pike; thanks for the reminder and the suggestion. You had me at vintage Christopher Pike. I am definitely going to take a look at this one! Thanks! Oh, I loved Christopher Pike! This one is going on my list! This sounds neat and I love that cover! I've read a little of Christopher Pike a long time ago but I liked it enough that I still have some of his books.